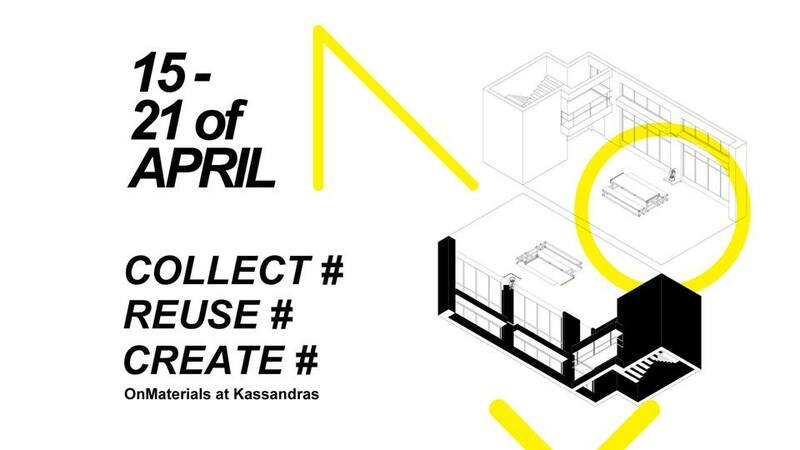 COLLECT | REUSE | CREATE is a one week-long sequence of public events and program, organized by OnMaterials in collaboration with Kassandras. Collect # How to build a network? Reuse # How to build a showroom? Create # Re-Creation & Re-surrection. What comes tomorrow? Imagined since the beginning as a collaborative platform willing to actively engage artists, designers, craftsmen, art institutions, exhibition spaces and schools focusing on material’s life cycle, we decided to formulate our first public event to start working together - theoretically and practically - towards sustainable cultural practices and the creation of OnMaterials’ Network. The event will be hosted by Kassandras, as part of their Rehab hosting series. The idea of reclaiming and rehabilitating materials is closely linked with Kassandras’ philosophy. As a studio and as a space Kassandras aims to be an environment for forward thinking of precise and innovative ways to imagine and build. In order to emphasize the immaterial aspects of our platform, sound performances will follow by the artists: Anna Apergi, Magda Lampropoulou, Dimitra Koustouridou and George Moraitis. Artists have been invited to explore the sound potentiality of the collected materials. We forecast an immersive space, within which the artists will perform, play and enact the materials through sound and bodies. OnMaterials is supported by START - Create Cultural Change.